UIP ACQUIRES FORMER GWU DORM FOR $36 MILLION: LHB Communications, Inc.
Urban Investment Partners (UIP) of Washington, DC has acquired a ten-story building at 2601 Virginia Avenue, NW across from the Watergate mixed-use complex for $36 million. The seller was George Washington University (GWU), which had used the building as student housing for 17 years. Hall on Virginia Avenue achieved notoriety while operating as a Howard Johnson hotel in 1972. Rooms 419 and 723 were used as lookouts for the “Watergate burglars,” who broke into offices of the Democratic National Committee in the Watergate office building. The ensuing Watergate scandal led to the 1974 resignation of President Richard M. Nixon. Room 723 was preserved as a museum until 2001, when the exhibit was moved to the GWU archives. GWU demolished the property’s interior about a year ago, planning to create new student and faculty housing, but decided to sell the property instead. CBRE’s Bobby Meehling, Andy Wimsatt, and Peter Larkin represented GWU in the sale. 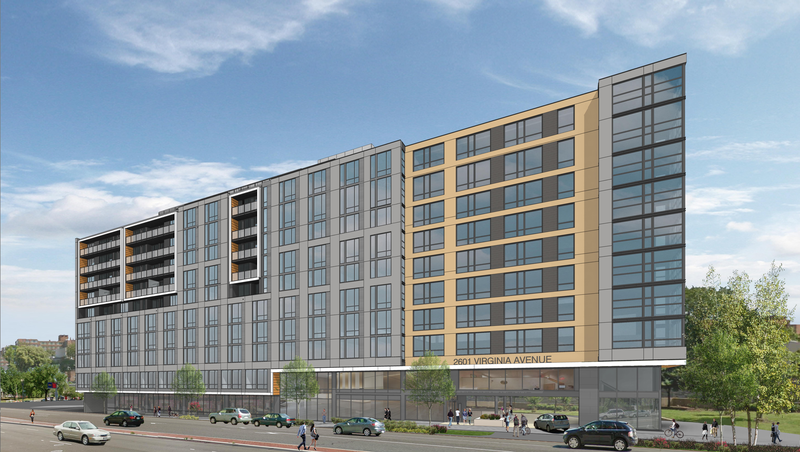 UIP plans to develop about 200 rental apartments within the existing 97,300 SF core and shell, and build about 50 more units in a new 40,000 SF addition on the building’s east side. UIP also will create an 8,000 -10,000 SF restaurant/coffee shop on the first floor, which will be a fully activated space for residents and neighbors. The building has underground parking for 200 vehicles, plus bike storage and care facilities with lockers. Boathouse, as the new development will be called, will offer residents numerous contemporary amenities as well as easy access to GWU, Georgetown, Foggy Bottom, the Potomac River/GT Waterfront, and Rock Creek Park. An expansive rooftop recreational area with river views will incorporate a deck, large swimming pool, fire pits, gourmet kitchen, and world-class (2,000 SF) fitness center. Other amenities will include a bike share program, library, multimedia theatre, and a 24-hour honor-based convenience store. Boathouse enjoys an irreplaceable location in the famous Foggy Bottom neighborhood in close proximity to Georgetown, GWU, the John F. Kennedy Center for The Performing Arts, and the recently renovated Watergate complex. Both Georgetown and Foggy Bottom are almost completely built out, with significant regulatory constraints preventing further development. With a walkscore of 86 and a bikescore of 94 (from www.walkscore.com), Boathouse will provide incomparable access to the area’s wealth of restaurants, shops, cultural destinations, and recreational venues. Earlier this year, UIP purchased three commercial office buildings from American University, and is converting most of the newly acquired space into new apartment dwellings. “Converting both hotels and office buildings to multifamily use is not much different than converting older apartment buildings, as we have done all over the city,” remarked Schwat. The UIP family of companies owns and manages more than 2,500 apartments in Washington, DC and Maryland and has renovated, restored and built more than 20 downtown apartment buildings and condominiums over the last ten years. UIP’s primary focus includes “heavy lift” renovations as well as working with tenants in Washington, DC, helping them exercise their TOPA (Tenant Opportunity to Purchase Act) rights. UIP also is active in entitling land, infill development, and acquiring residential assets in the close-in Washington, DC suburbs. For more information, visit www.uipllc.com, www.uippm.com and www.uipgc.com.